Have you seen the latest issue of Bon Appetit? The one where Gwyneth is smiling at you from the cover? If not, take a look the next time your standing in line at the grocery store. Gwyneth’s pictures are redonkulous. I don’t know anyone who prances around in their kitchen wearing skin-tight, thigh-high dresses eating huge plates of pasta. I wanted to dismiss the issue after laughing at those photos but luckily I didn’t because there was at least one gem of a recipe in there. This recipe promised a simple technique to produce outstanding results and I’m happy to say it lived up to it’s promise. The chicken is succulent and flavorful with a beautiful crisp, salty skin. It’s great for those days when you are craving crispy chicken but don’t feel like frying or roasting a whole bird. Also, chicken thighs are dirt cheap so it makes a great family meal. If you want to add another punch of flavor, throw in some sprigs of thyme or rosemary or even a few lemon wedges. Taste: Richly savory and, well, like chicken! Texture: Salty, oh-so-crisp skin with a super moist meat. Ease: This is probably the easiest way to enjoy perfectly cooked dark meat chicken with a scrumptious fried skin. Appearance: I don’t know about you but crisp skin makes my mouth water. Cons: None that I thought up. Would I make this again? Yes, yes, yes, a thousand times yes! Preheat oven to 475 degrees. Season chicken liberally with salt and pepper. Heat oil in a 12-inch cast-iron skillet over high heat until hot but not smoking. Nestle chicken in skillet, skin side down, and cook 2 minutes. Reduce heat to medium-high and continue cooking skin side down, moving chicken around to ensure even heat. Cook skin-down until fat renders and skin is golden brown, about 12 minutes. Transfer skillet to oven and cook 10-13 minutes more. Flip chicken so the skin side is facing up and cook until the skin is crisp and the internal temperature registers at least 165 degrees, about 5 minutes more. Transfer chicken to a plate and allow to rest 5 minutes before serving. Garnish with fresh herbs, if using. 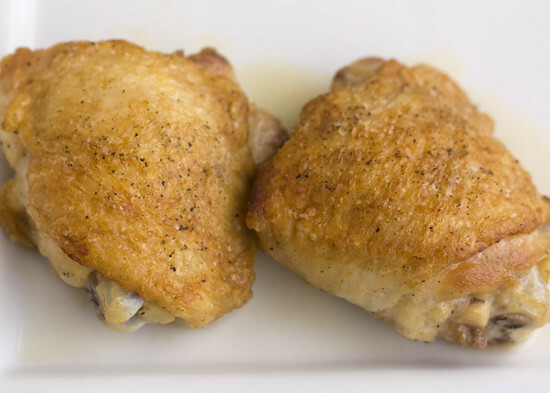 via How to Pan-Fry Chicken Thighs to Crisp Perfection | Handle the Heat.